1940 was a special year for Hamilton wrist watches. Select versions of coral gold watches were made available in 1940. Hamilton's first sweep second wrist watch movement, the 987S, was introduced. And several watch models were introduced and manufactured only for one year. 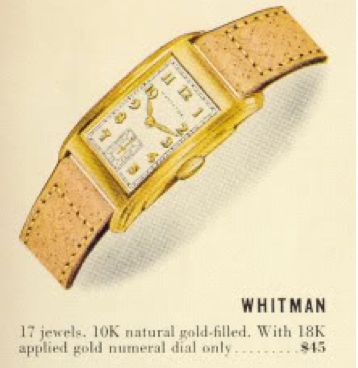 One of the 1940 "one year wonders" was the Whitman. 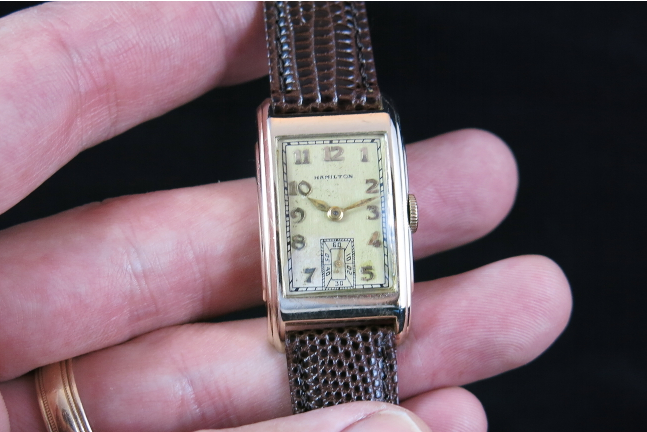 It looks similar to earlier tank-style watches from 1935 but is best identified by the slight stepped-protrusion on the sides of the case. The case came only in yellow 10K gold filled and was offered only with an AGN dial with solid 18K gold numerals on sterling silver dial. 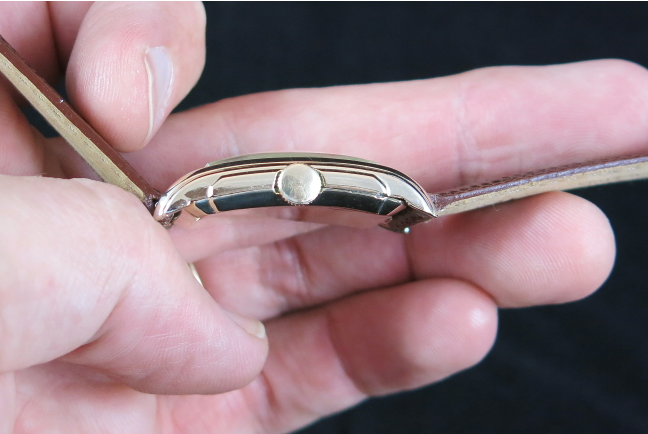 Under the hood is a 17 jewel, 14/0 sized 980 movement. I recently purchased a Whitman because I had never seen one for sale before. I don't know if that's because it's a rare watch or if I just never really differentiated it from the other earlier watches from the 1930's. If it's not rare, it's certainly uncommon. The seller listed it as "running and in good overall shape with a little gold loss to the back". As received, I could see it would definitely benefit from a new crystal and some cleaning. I got a little concerned though when I looked at the reverse. 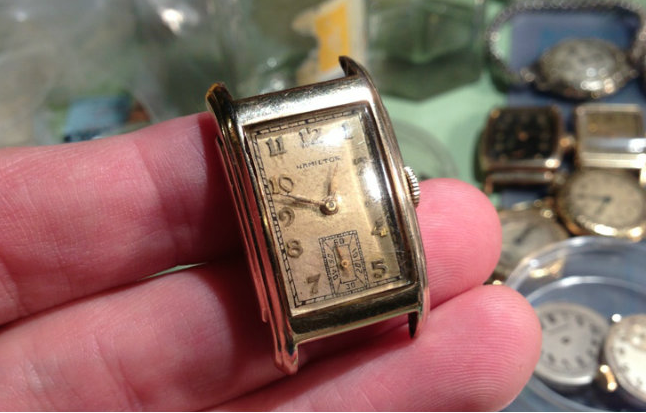 "A little gold loss" to the seller really means "extensive wear through and holes in the case". Needless to say I was a little angry with the poor (fraudulent maybe) description. Here's a better shot of the condition of the case back. Putting a freshly serviced 980 movement into a case like this is a recipe for disaster. The point is to keep dirt and moisture out, not invite it in through multiple holes! Now, here's the thing. 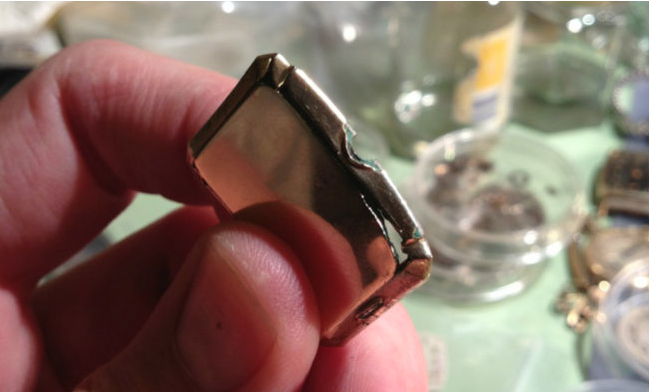 I've had marginal luck taking cases with worn out lug holes to a jeweler for repair. 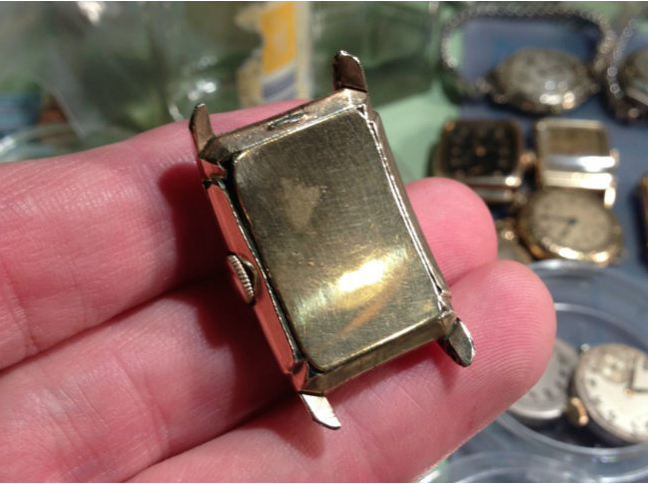 But I've never come across a jeweler who said they could repair worn gold filled cases like this. Ordinarily I would have just sent the watch back to the seller as "not as described" but I didn't pay too much for the watch. If it was a more common watch the movement would just become a spare 980 and the dial and case would go into my "scrap pile". But this is an uncommon watch. I did a little research and it turns out there is a relatively new precision welding technology that some goldsmiths use involving "a laser" (insert Dr. Evil pinky-to-corner of mouth reference here). I read that by using a laser, a goldsmith could do incredibly precise work on jewelry with great results. Doing a little more research gave me the phone number of a very friendly store - halfway across the country from me. So I sent them my Whitman case and two others that I will feature in a future post when I finish the other parts. Well, I got the results back today and I am very impressed and equally pleased. 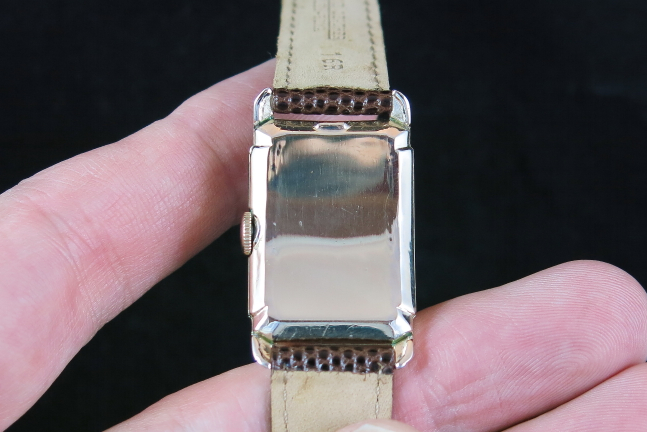 Here's some "after" shots of the same Whitman, now with a new glass crystal and lizard strap. The back has some waviness along the edges and I wouldn't try to pawn this watch off as "like new" but it's definitely a remarkable improvement and properly protects the movement now. So, I'm sure you're wondering how much did it cost? To repair the case back was $100. That's a lot of money but if it had less extensive damage it would have cost less. The other two cases I had done cost less but they had damage enough to make an otherwise nice watch look bad. Now they both look fantastic (stay tuned). In the majority of gold filled situations it would not be worth it to pay that much to repair an otherwise common case. But there are some pretty rare gold filled watches where $100 in case repair is money well spent. Also, if this was "grandpa's watch" it would also have been money well spent. If you've got a gold filled watch case that you'd like repaired, check out Buchkosky Jewelers in Roseville, Minnesota at buchkosky.com and tell them "HandyDan sent me". I am greatly encouraged to see this type of restorations. I have a few vintage gold filled cases that need some of this same work. I will definately use this vendor you have mentioned Your watches look great, by the way. Yes, the folks at Buchkosky Jewelers are good people, friendly and do a nice job. It's not inexpensive though.